Not only was it Christmas this week, but a few days beforehand I celebrated my own birthday. Now into my mid-50’s, I guess it must be almost impossible for others to buy for me. Not because I have everything I need, but age gives you simpler tastes and requirements maybe and whenever anyone asks me what I would like, I can never think of anything I actually want. However I did receive a present for both celebrations from my “better half” of a new laptop computer. My old ASUS eee netbook had seen better years and I was fortunate to receive a Hewlett-Packard Pavilion Touchscreen example, running Windows 8.1 and as I write, I am still learning the ins and outs of it. On 1st January, it will be the 75th anniversary of the founding of Hewlett-Packard. William"Bill" Redington Hewlett (May 20, 1913 – January 12, 2001 and David Packard (September 7, 1912 – March 26, 1996) both graduated from Stanford University in 1935. In 1939, Packard and Hewlett established Hewlett-Packard (HP) in Packard's garage in Palo Alto, California with an initial capital investment of $538. The decision of whose name came first came about from the toss of a coin, from which presumably, Mr Hewlett was the victor. Hewlett-Packard (or HP as they are generally referred to these days), is the world’s leading PC manufacturer although they did fend off a challenge to their supremacy from Chinese competitor Lenovo (click HERE for details). So far I am very pleased with my HP Pavilion and am even getting to grips with the new Windows operating system and the touchscreen. So on New Years Day, as well as singing "Auld Lang Syne," please join me in wishing wish a very Happy 75th Birthday to HP. Messrs Packard and Hewlett’s fine company have brought new life and fun to an aging fool’s computing activities. On Saturday 21st December 2013, it will be the shortest day here in the Northern Hemisphere, 100 years since the first crossword puzzle was published in the New York World newspaper, the 50th anniversary of the first appearance of the Daleks on Doctor Who and also 50 years since the death of one of the greatest batsmen in world cricket - Sir Jack Hobbs. 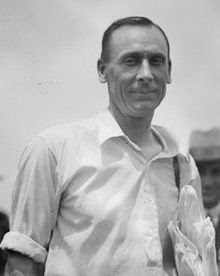 John Berry “Jack” Hobbs was born in Cambridge on 16th December 1882 and became the leading run scorer and century maker in first class cricket, amassing 61,760 runs and reaching 3 figures on no less than 199 occasions (Wisden, the cricketer’s bible, dispute these figures however, claiming he achieved 61,237 runs with 197 hundreds) . Known to cricket players and fans alike as “the Master,” he played for Surrey between 1905 – 1934, with his England career stretching for 22 years between 1908 and 1930. 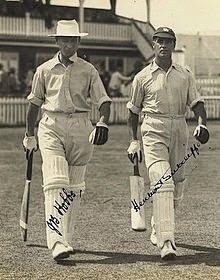 A right-handed batsman and occasional right arm medium pace bowler, Hobbs excelled in the field, being a specialist fielder in the covers. In the 1920s he was the UK’s biggest cricketing star and, similarly to sporting stars of today, lent his name to commercial products. He had greater financial security than many of his contemporaries but continued to be concerned that his family kept the stability and security lacking from his own childhood. He became the first professional cricketer ever to be knighted (in 1953), yet was very reluctant to accept the honour. He was eventually persuaded to take the honour when it was explained that he was taking it not only for himself, but for all professional cricketers. Sir Jack passed away in 1963 only 9 months after his wife, who had been unwell for a number of years, died. His health began to fail soon after her death and they are buried in Hove cemetery where they both spent many of their later years. So it's half a century since "the Master" left us. The great man should be turning in his grave after the gutless way the current England team recently relinquished the Ashes in Australia. If only there was anyone out there with half of his batting talent, we would at least have put up something of a fight! Christmas Tree: Star Vs Angel? Have you got around to putting up your Christmas decorations yet? If so, is your tree of natural pine, or do you go in for an artificial one? I must admit that for numerous reasons, all too tenuous to go into great depth here, we always have one of the latter persuasion. But more to the point (especially for this posting) is your tree is topped with a star or by an angel? The concept of a Christmas tree was introduced in Germany as far back as the 16th century (and possibly going even further back) when Christians brought a tree back to their homes and adorned it with decorations etc. Although the idea of a tree at Christmas had been brought to the British shores previously, its main popularity in the UK has been attributed to the husband of Queen Victoria, namely Prince Albert. 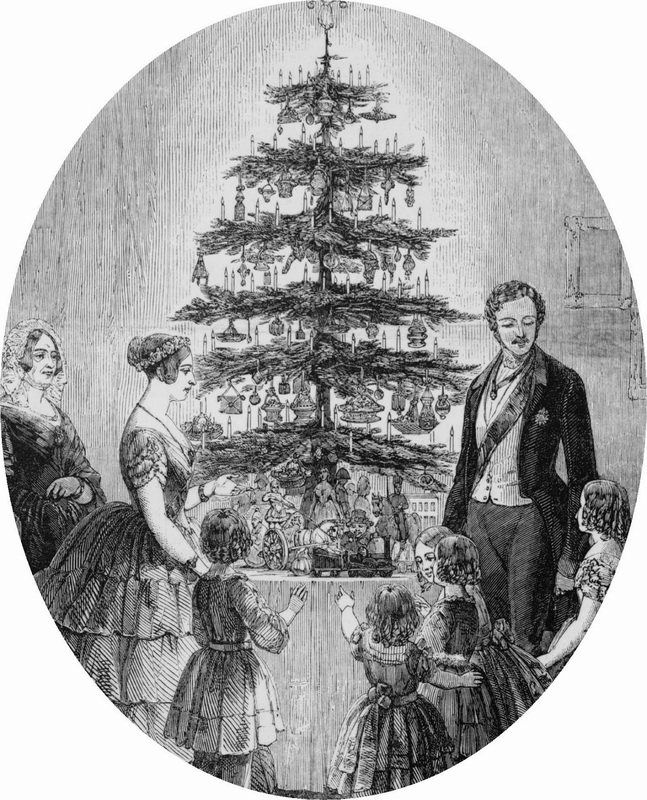 In 1848, Victoria, Albert and their family were pictured on the cover of the Illustrated London News, all standing around their tree at Windsor Castle and soon enough, the tradition was being followed by many of the wealthier middle-class English families who took great pleasure in covering them with the likes of apples, nuts and dates etc. "After dinner... we then went into the drawing-room near the dining-room... There were two large round tables on which were placed two trees hung with lights and sugar ornaments. 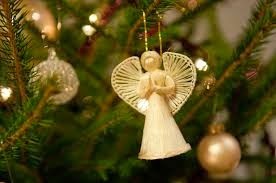 All the presents being placed round the trees..."
In these earlier days, Victorians preferred the use of an angel at the top of their trees which signified the angel who proclaimed the birth of Jesus to the world. Moving on to the 1870s with the growth of the British Empire, a nationalistic fervour took over and many people took pleasure in topping their trees with the Union Jack (Flag). 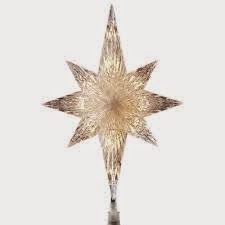 Many people however (and I have to admit to being among them) like to top their tree with a star, signifying the Star of Bethlehem from the Nativity. So, if you have one, how do you top your tree? If you have enjoyed this article, may I request that you click on one of the adverts featured on the page (they earn me the odd penny or two allegedly! ).